The main objective of the Mascopt (Mascotte Optimization) project is to provide a set of tools for network optimization problems. 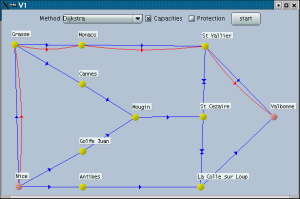 Examples of problems are routing, grooming, survivability, or virtual network design. Mascopt will help implementing a solution to such problems by providing a data model of the network and the demands, libraries to handle networks and graphs, and ready to use implementation of existing algorithms or linear programs (e.g integral multicommodity flow). Mascopt is Open Source (under LGPL) and intends to use the most standard technologies as Java Sun and XML format providing portability facilities. 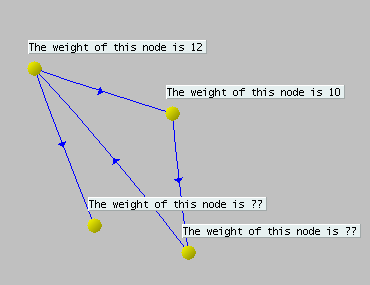 We finished to implement graph data structure, several basic algorithms working on graph and input/output classes. Mascopt also provides some graphical tools to display graph results. We are currently writing network packages and performing experiments on Wdm networks.